This post was originally published here on November 10, 2014. It’s one of my favorite Fall side dishes, so I thought it was about time to give the photographs and text a fresh look. Enjoy! I mentioned in my last post that it’s going to be full on Thanksgiving prep mode here on the blog for the next couple of weeks. So I hope you’re ready for the onslaught of Holiday-inspired dishes that are going to be coming down the pipeline. And if you have any last minute suggestions or requests, please let me know. I still have a few more recipes to develop, and I’m open to your ideas! This space is as much about YOU as it is about me! As for today, I’m re-visiting (and re-vamping!) 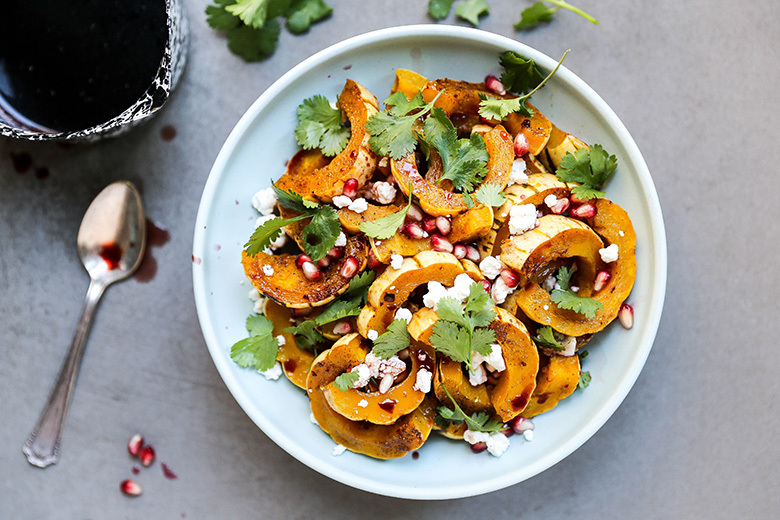 this recipe for Roasted Delicata Squash with Pomegranate and Goat Cheese. Which might just be one of my favorite ways to prepare delicata squash EVER! And it’s easy and festive enough for both Thanksgiving and Christmas. Sooo…I thought it was a blog post worthy of a makeover. I use delicata squash very frequently this time of year, maybe even more than any other squash variety (yes, even more than butternut squash!). If you haven’t given this oblong squash a try yet, I highly encourage you to do so. The flavor is mildly sweet and creamy. The flesh isn’t as firm/dense as other squash varieties. And the skin is thin. It’s both of these last two qualities that make delicata squash MUCH easier to cut and handle. Also, the skin is totally edible! Which means less work (no peeling!) and a very pretty presentation, too. I love the using delicata squash halves as “bowls”. And the sliced “half moon” shapes are great in salads or used as toppers for sandwiches, tacos, tostadas, etc. 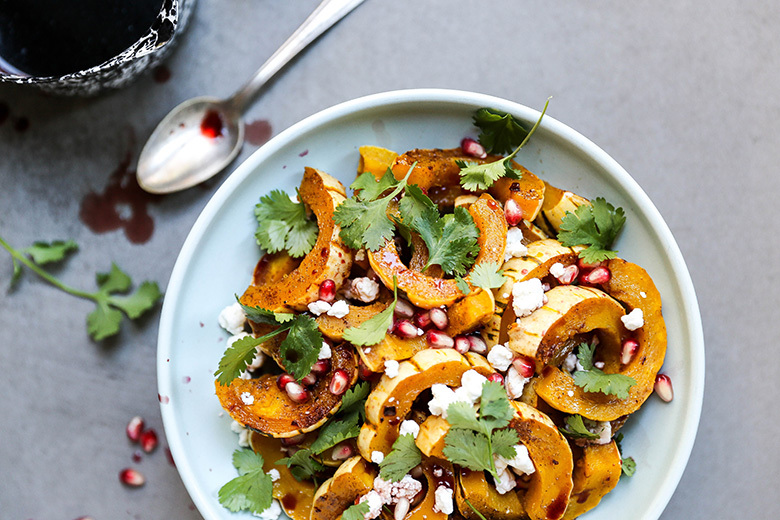 This Roasted Delicata Squash with Pomegranate and Goat Cheese is definitely a side dish you need to try out this Holiday season. The fragrant warming spices make it feel all cozy and festive. And of course, the color combination isn’t half bad, either. It’s a looker that also tastes amazing. What more could you ask for in a Holiday side dish?!?! 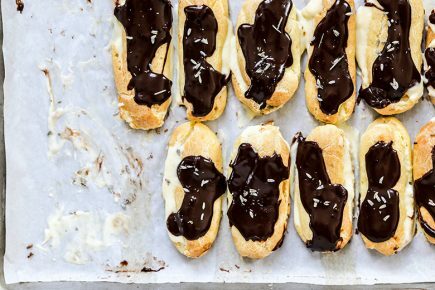 Need more November cooking inspiration? 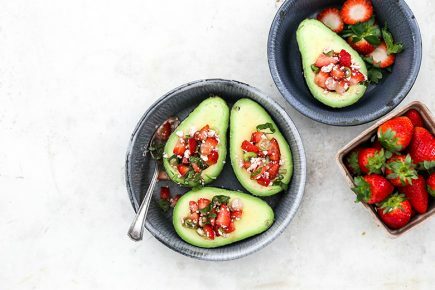 Then check out my friend Becky’s monthly produce guide, which is filled with tons of recipe suggestions to help you take advantage of the bounty of fruits and vegetables that November has to offer. I know you’ll find lots of goodies for your Holiday celebrations! 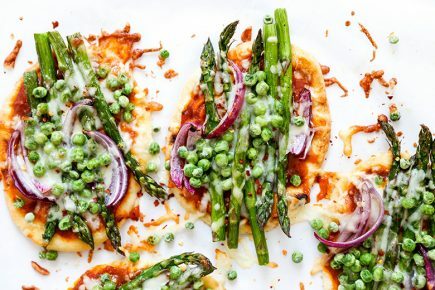 And for even more ideas, check out the links below to see what seasonal recipes some of my blogging friends created this month! Slice the delicata squash in half lengthwise. Scrape out and discard the seeds. Then cut the squash into 1-inch half moons. Add the squash to a large baking pan and toss gently with the olive oil, salt, cinnamon, cardamom and red pepper flakes. Transfer to your pre-heated oven and bake for about 35 minutes, or until the squash is tender. Remove from the oven and set aside. Meanwhile, combine all the ingredients for the dressing in a small saucepan over medium heat. Simmer for about 10 minutes, or until the dressing is reduced to about 1/3 of a cup. Remove from the heat and set aside. To serve, arrange the roasted squash on a platter or in a large bowl. Top with the goat cheese, cilantro and pomegranate arils. Then drizzle with the dressing, starting with a couple of tablespoons and adding more, if desired. Serve immediately. Thanks, Jennifer. 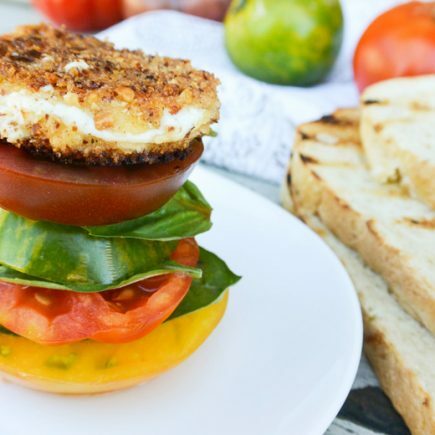 Goat cheese makes everything better! So glad you had such a great time at Mixed! Loved seeing your photos on instagram. And I 100% agree on the side dishes front. I was vegetarian for 8 years, and Thanksgiving was the one holiday that it didn’t matter because there were so many amazing side dishes!! Thanks, Sarah! Side dishes for the WIN! 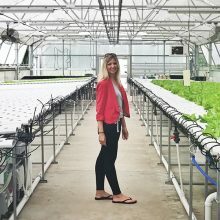 I loved your instagram pics from Mixed! Sounds like you had a fabulous time! This roasted squash looks amazing! I’ve never thought to roast it before, so I’m loving this. And what a great idea to toss in some pomegranate! Thanks, Gayle! Pomegranates are so festive that I think they are a necessity this time of year! This looks like great recipe, Liz! I am so excited to try it. Thanks, Tori! Let me know when you try it! Yay! So glad you had a good time at the conference! You had to know that delicata squash is one of my favorites, right? I feel like this side dish was made for me! 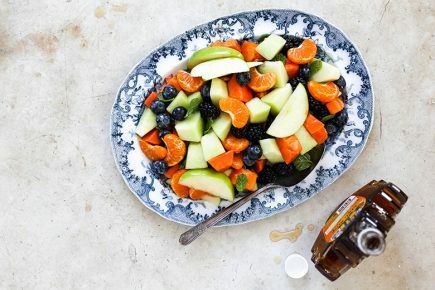 Love the pomegranate-balsamic dressing! Delicata squash is the best. Taste-wise it’s the bomb. But I’m also totally lazy and love that you don’t have to peel it! Wish I could have Friends-giving with you. I would totally bring you this dish! First of all…we are twins today!! I just posted a salad with these awesome ingredients. And girl does this look AMAZING!! And second of all…I loved meeting you in real life. Was the highlight of this weekend 🙂 Friends forever!! I saw that we are twinsies today. Great minds think alike! Friends forever! Yeeeeah! I’m so happy you had fun at the Mixed conference! I bet all that coffee and sugar made for a high-energy fabulous time. And now, you have all the tasty roasted winter squash to bring you back to normal blood sugar level 😉 Happy Monday, dear! Thanks, Julia! I’m going to need a truck-load of squash to level me out! Oh man, this looks so incredible! Let’s have butternut squash with roasted squash on the side for dinner today 🙂 Mixed seems like such a fun event–glad you had fun! Yes, that is the best plan ever. I’m down for a squash-topia! Thank you so much, Paula! So glad that I got to finally meet you! This looks so pretty! It’s perfect for a holiday meal because it’s so gorgeous AND tasty! Thanks, Bri! It is definitely perfect for the Holidays! I love all of the flavors going on in this dish. 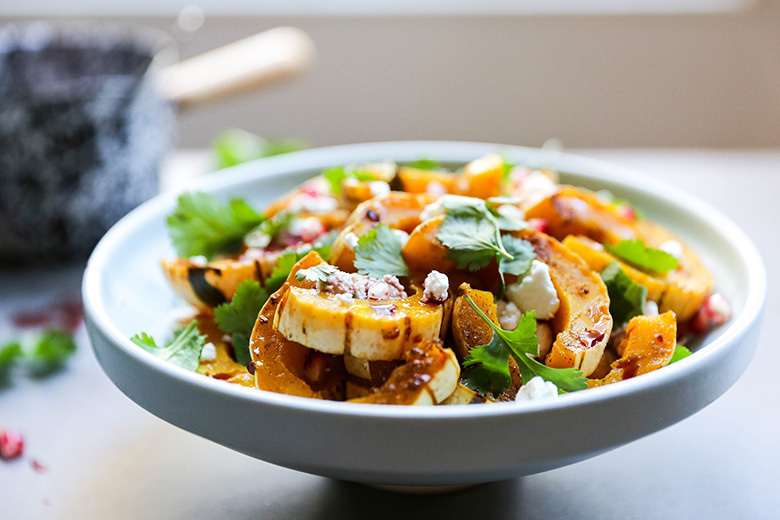 Goat cheese and balsamic are two of my favorite things, and adding cinnamon and cardamom to the squash sounds delicous! Sounds like you had a fab time in VA ! Loved all your IG pics. 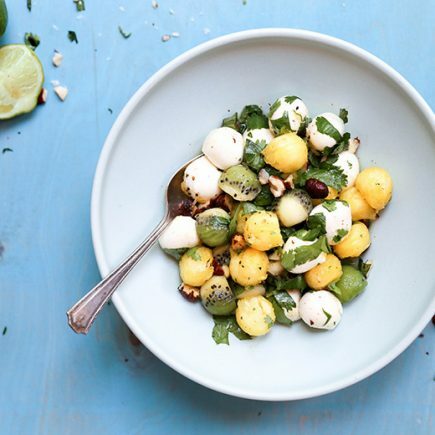 This salad however….is absolutely beautiful! I love all the colors. Thank you, Katya. Virgina and the conference was great! Thanks for the salad love! Yum!! I strongly dislike when all of the side dishes at Thanksgiving are all one color! You, my friend, have fixed this problem! 🙂 Gorgeous dish! What a fun experience, Liz! I can’t wait to go to my first blogging conference. This dish is so gorgeous and colorful! 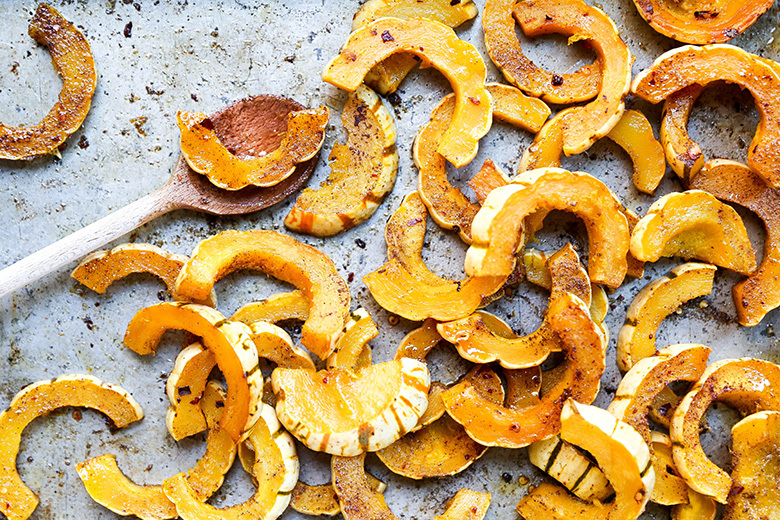 I love delicata squash — it’s one of my favorites, and these flavors sound delicious! If anything could ever get me to feel more than “meh” about squash, this is it. And I think I have all the ingredients at home right now. Perfect! Thanks, Annie! I hope it excites you! Wow this looks incredible! I love the pop of colour from the pomegranate and I’m sure that the goat cheese adds some amazing tang to the dish. Perfect for Thanksgiving! Thank you, Louisa! I’m so glad you stopped by. Let me know if you try out the recipe! This is a gorgeous salad! Thank you for the wonderful compliment, Amanda! Thanks, Beth. Yeah for ALL the side dishes! SO glad to hear you had fun at Mixed and yay for getting to hang out with Zainab! She’s the best. I <3 her big time. This roasted squash dish is a NEED in my book. Love all these fall flavors mixed up in one dish! Thanks, Joanne! Wish you could have been there too! Then it would have been a scientist-blogger take-over!! YUM, this sounds a lot like a dish that was on special at a favorite veggie restaurant, Annapurna, in Santa Fe. I am happy to have the memories, and a tasty recipe! That’s so great to hear, Jessie. Thanks for stopping by! I love revamping old recipes. It feels so good. This one is awesome (I too love delicata!) I just read that you can eat the skin of kabocha too. I never knew that! Yes, some of the old posts are kind of scary and in need of a makeover. Lol. Yes, I’ve heard that about kabocha but I haven’t tried it yet. What a fabulous recipe! I have a Delicata in the pantry–waiting just for your recipe! Woohoo! I know you’ll love it, Letty! This IS GORGEOUS!!! And I love cutting delicata squash this way so you can see the curvy edges. Such a fun recipe Liz! Hope you’re enjoying all of the side dish experimenting as I am! Yes, I love the presentation! Delicata is so pretty! This is the PERFECT side dish!!!! It’s got all my favs! 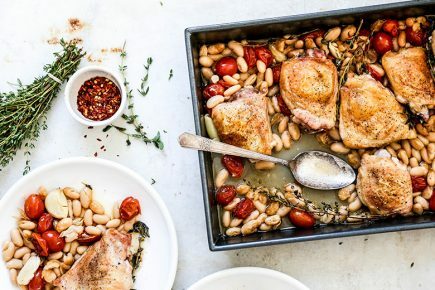 This dish has me dreaming of Thanksgiving! How many more days?! I pretty much do during the Fall and Winter months! What a beautiful recipe- I love delicata squash and the colors are so pretty in this! It’s starting to feel festive in my kitchen! I could eat this all fall long! I pretty much do exactly that! Rob sure makes a lot of trouble with his food preferences! Lol! I just love how festive this dish is. Totally makes me ready for the Holidays! 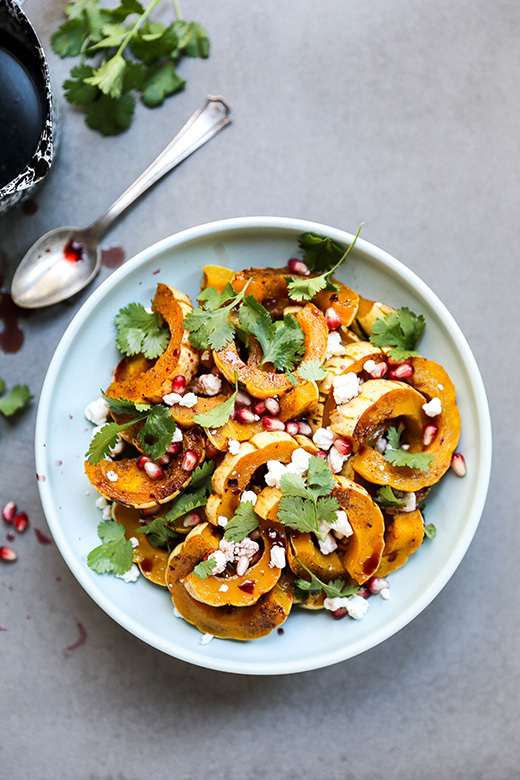 Highlighting two of my favorites- delicata squash and pomegranate seeds! I can see why this is one of your favorite sides this time of year. I’m really excited about making this, but I’ve never seen delicata squash where I live! Maybe I can drive to Whole Foods and find it there. I’m so intrigued about being able to eat the skin! 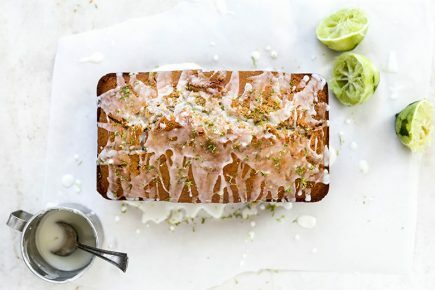 Love this recipe, and all the beautiful photos. Hi Mimi! Whole Foods generally has delicata squash (and lots of other grocery stores as well, now that it’s becoming more popular). So hopefully you can find some!